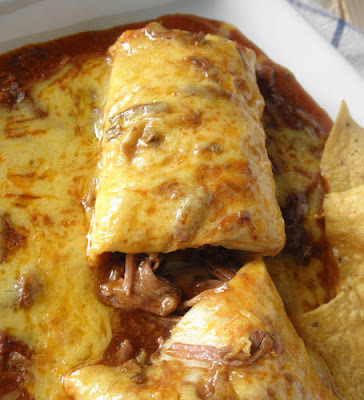 Tender chunks of beef in a yummy sauce, wrapped in a soft flour tortilla, smothered in more sauce and cheddar cheese, and then broiled to bubbly perfection. Mmmmmm. I don't even think I'd had chile colorado until I met my husband and he took me to Casa Gamino in Paramount, California. Now, Casa Gamino is MY idea of great Mexican food. Their salsa is fresh, peppery, and perfect. Their chips are made in the restaurant. And everything I've ever tried there has made me happy. This recipe isn't exactly Casa Gamino, but it's pretty darned close, and I like to exclaim every time I make it, "This is the BEST Mexican food in Iowa!" Sadly, I mean it. The times below are approximate. Mexican cooking is not an exact science in my house the way baking is. The meat can rest for a little while if it's done cooking early, but if you try to eat it before it's reached tender perfection, you might be disappointed in the results. Try this out and let me know what you think. I'm willing to bet you'll think it is is de-li-ci-oso. Put beef, bouillon, and enchilada sauce into a crock pot and cook on low for 7-8 hours**, or until meat is very tender. (Can also cook on high for maybe 3-4 hours.) I've also cooked it in a dutch oven for about 4 hours at 325 degrees. More meat, more time. A third option is to cook it in a large heavy saucepan--bring it to a boil on high heat, reduce heat to low, cover, and simmer for 1 1/2 to 2 hours, or until the meat is tender. If you go with a method other than the crock pot, make sure the pot is covered and pretty well sealed to minimize evaporation of the liquid. When beef is done (very tender and flakes off when stirred), taste and add more salt, if desired. Heat up refried beans in the microwave (covered and in a microwave-proof dish, of course)and put your oven on broil. On an oven-proof plate, or cookie sheet even, lay out a tortilla. Place on tortilla about 1/2 cup of the meat, drained by using a slotted spoon, and a spoonful or two of beans. Roll into a burrito (hopefully you know how to roll these). Pour some of the remaining enchilada sauce from the crock pot over the burrito to cover it. Sprinkle with some cheddar cheese. Broil until cheese is bubbly, about 2-4 minutes. *Lots of people ask about what brand of canned enchilada sauce I use. There's even some controversy there. Lots of people seem put off that I use a canned sauce and make their own. I originally used Las Palmas mild because that's what was mostly available in California. When I moved to Iowa, I had to switch to Old El Paso mild, and now my family is used to the super mildness of that and comment how spicy it is when I use Las Palmas. Both are great, as far as I'm concerned, but the Old El Paso mild is definitely the way to go if you want a mild experience. **Note: You may have to adjust the cooking time depending on this size of your chunks of meat. Larger chunks (like 1 1/2 to 2 inch chunks) may need a little longer. Scrappy sort of chunks that are less than an inch may need a shorter cooking time.